Blackberry plants are sometimes thought of as plants to eradicate from a garden thanks to their sharp thorns and ability to grow in practically any soil. However, when you raise blackberries in containers such as tubs or half barrels you can reap the benefit of these sweet, highly useful berries with none of the inconvenience of having to cope with them as they spread and grow. The primary thing you need to provide your container-grown blackberry is plenty of sun. Position the tubs or half whiskey barrels in the exact place you want them to be. The container will be difficult to move once it is filled with soil. Cut out a piece of fine wire screening or mesh for each of the tubs or barrels. The wire screening or mesh should be the approximate diameter of the bottom of the tub or half barrel. Set the wire screening or mesh into the bottom of each container. The screen will prevent the soil from washing out of the container's drain holes. Spread out a 1/4- to 1/2-inch layer of fine pea gravel over the top of the wire screen or mesh. The gravel will help facilitate drainage. Fill the containers about 1/2 full of a good quality potting mix. Or if you want to create your own potting soil, mix together equal parts of bark or perlite, sand, and peat moss. Pour water into the growing containers until the soil is visibly well saturated. Remove the blackberry plants from their growing containers. Flip each container upside down and use a trowel or a block of wood to strike the rim of the container a few times to loosen the root ball from the container. 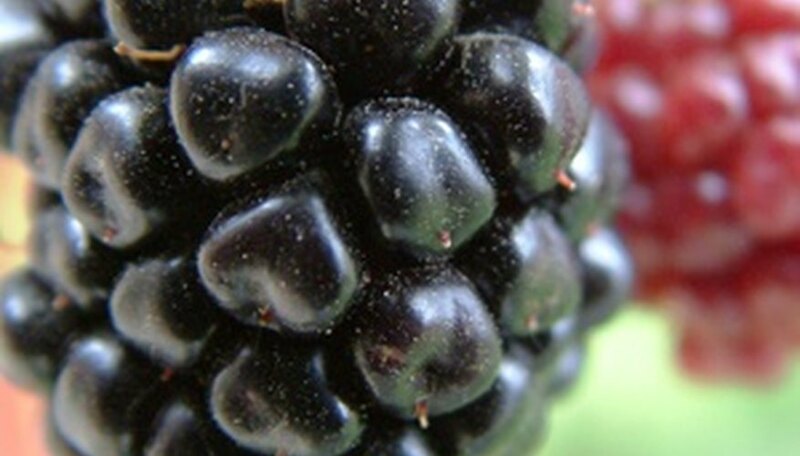 Set a blackberry plant into the tub or half barrel. If you are using a large container like a half barrel, you can plant up to two blackberry plants. The National Gardening Association suggests planting blackberry plants approximately 1 inch below the level they were growing in their original containers. Scoop in the potting mix around each of the blackberry plants to fill the containers full of soil. Tamp down the soil around each of the blackberry plants to help settle the soil and remove any air pockets. Water the blackberry plants thoroughly. After the blackberry plants are established and growing, fertilize each every spring using a granular fertilizer such as 5-10-10 or 8-8-8. Read the directions so you will know how much fertilizer to use per blackberry plant. Blackberry plants should be planted in the spring. Keep the blackberry plants well watered in the containers. Water at least once weekly or often enough to keep the soil moist but never soggy. Each winter cut back blackberry plants to approximately 3 to 4 feet. Blackberry plants usually have thorns, so be sure and wear gloves when handling or planting blackberry plants.